Ireland is an island on the north western edge of Europe facing the Atlantic Ocean.It has been inhabited for the last 10,000 years. In earlier times it was divided into five provinces but today it contains four provinces and they are Ulster, Leinster, Munster and Connacht. The ancient capital of Ulster was Emain Macha; Dind Rig may be seen as the capital of Leinster and Cashel of Munster and finally Cruachain of Connacht. The spiritual capital of Ireland was Tara which is in Leinster. Like most mythologies Irish mythology has a mythos or a sacred narrative and a religio, that which binds members by vows and rules. In the Irish context the mythos is the strongest component and the religio is the weakest. This means that preChristian Ireland did not have a religion as such; this absence of apparent structure does not mean that the island lacked a mythic dynamic. The Island receives its name from Ériu, a goddess and her name has been translated to mean ‘regular traveller of the heavens.’The naming of Ireland from a goddess shows the influence of goddesses in our early history. When a word ends with the vowel ‘u’ it shows that it is referring to a goddess. Generally the Irish for Ireland is Éire and this is the version that you will find on government papers and on all postage stamps. However most goddesses are to be found in threes and Ériu shares a triad with Banba and Fódla. Banba represents Ireland in the warrior sense and her ‘crown’ can be viewed at the top of the Inishowen peninsula which is the most northerly part of Ireland. Thus Ireland’s most northerly part which is at Malin Head represents her ‘crown.’ Situated here was a Martello Tower used in the early 19th century as a look out for Napoleonic invasions and which has since been converted to a tower house.Fódla represents Ireland in the poetic or spiritual sense and Ériu is the mother goddess who nurtures the island of Ireland. As this essay is based on an analysis of myth, it is worth being clear as to the meaning of the word. The word myth (Greek. mythos) originally signified speech or discourse and was identical with the Latin logos or word. After the age of Herodotus c. 430 BC, it came to be synonymous with the Latin word fabula meaning fable or legend; from the 19th century it was an idea or fancy presented in the historical form. The Oxford Dictionary defines myth as: A purely fictitious narrative usually involving supernatural persons, actions or events, and embodying some popular idea concerning natural or historical phenomena coincides with the popular usage of the word where it is synonymous with fallacy. Yet were one to describe Jewish mythology as a collection of fallacies or Christian or Islamic one might need a certain amount of discretion in choosing one’s audience. So whereas one may argue as to its efficacy there is no doubt as to the power and persistence of myth. If one asks who were the original peoples who carried preChristian mythology with them to Ireland one is bound to say that it was the Picts or in Irish cruithin. These people were the original inhabitants of the British Isles; Julius Caesar named them the Priteni, but in time due to the Roman invasion they were forced northwards to Scotland and as the Romans never invaded Ireland (too scared!) Ireland remained a stronghold for these tribes and for their myths, rites and customs. It also became a haven for one of the last aboriginal tribes of Western Europe living in the last habitable island, away from the imperial armies of the Roman Empire and with nothing beyond but the vast and wild Atlantic Ocean. The Picts were so called because they painted their bodies, and the particular colours they used defined their tribe or status, thus Lugaid Reo-Dearg or Lugaid of the Red stripes from the two stripes of red on his face. Today at sports matches people now paint their faces to match the colours of their team. Lugaid Reo-Dearg was a member of the Dál nAraide which was an Ulster and Pictish tribe. Another tribe which was connected to the Phoenicans from the Middle East were the Fomorians. They took their god Ba’al with them and he is known in Irish mythology as Balor. He is a sun god and the month of May in Gaelic or Irish is Belteine or the fire of Balor. 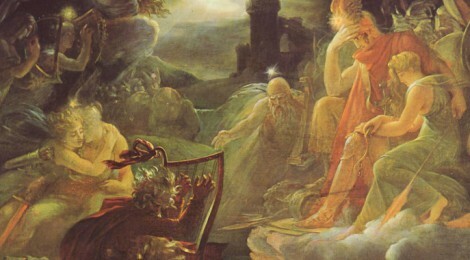 From the Caananite Ba’al to the Roman god Belus to the Irish Balar or Balor; he remains as a sun god through various lands and cultures.The Phoenicians were merchant traders and the story of Balor is still told on Tory Island on the north coast of Ireland; contained in the oral tradition for over two thousand years. Earlier it was mentioned that Ireland was on the western edge of Europe facing the Atlantic Ocean, and off the west coast are the three islands known as the Aran Islands, part of County Galway; the most distinctive feature of these islands is the plate of limestone which covers them. This carboniferous limestone was the muddy base of the Atlantic Ocean about 300 million years ago. On the largest of these islands, named Inishmore, is the great fort of Dún Aengus and this is the most striking of all the ancient monuments on the Aran Islands.It looks like and probably was an amphitheatre with a semicircular wall which has seating for thousands. It stands on a vertical cliff overlooking the ocean. Dún Aengus stands almost a hundred metres above the Atlantic. It has an inner enclosure which contains a rectangular platform of limestone. This platform is central to how one ‘sees’ Dún Aengus.We shall come back to this later. There are four enclosures or ramparts surrounding Dún Aengus. There is also a chevaux- de- frise [upright protective stones] between the third and fourth ramparts. For some archaeologists though not all, Dún Aengus is seen as a fortress where the ‘outer wall’ fell into the sea. The contention that the monument was a fortress is backed by the presence of the defensive chevaux-de- frise. However if the ‘wall’ did not fall into the sea and the chevaux-de-frise was merely for reasons of prestige, then what you see is a magnificent amphitheatre, with terraces for seating, with a platform, or raised structure for ceremonial celebration, from which the celebrants looked out to sea and the setting sun, to the sound of bronze age horns and drums. A probable time for these ceremonies was mid-summer during the Bronze Age [1800-500 BC.] and early Iron Age for the ritual of mating and harmony. The symbolic mating represented the coming together of the sun and the moon, with a male representing the sun and a female the moon. When I was lecturing in Dublin I brought Erasmus students from Europe and American students from Iowa to this site and we were joined by Simon O’Dwyer, the Irish expert on Bronze and Iron Age horns and his wife Maria who plays the bodhrán, a leather drum. After a brief talk on the site from the platform, Simon and Maria played Bronze Age music. When they finished we were surprised by the arrival of a group of women who sang many old Irish songs in Irish and continued singing while the sun went down leaving in its train a long golden pathway to the distant horizon. The distant western horizon became the basis for certain concepts of the otherworld in Irish mythology. This world of the spirits and gods was known in the early tales as Mag Mell (plain of honey), Tír Tairngaire (land of promise) and Tír na nÓg (land of perpetual youth). A rite that survives in manuscripts is known as imram or ‘rowing about.’ The imram was an ancient rite practised before death; two places associated with this rite are Ballinskelligs in the south west of Ireland and Stroove on the Inishowen Peninsula in the far north of Ireland. A person would go in a small boat or coracle (a round boat) out to sea and the belief was that as the earth was flat as soon as the person reached the horizon he or she would fall down with the sea and enter the Otherworld. This custom became in time inculcated into various legends the most famous being the voyage of Bran or Imram Brain. This saga is found in the eleventh century manuscript Lebor na hUidre or The Book of the Hide. It was probably written in the 7th or 8th century according to the noted German linguist Kuno Meyer. There are many imrama in our stories and the last recorded is of St. Brendan who set out in the 6th century from Brandon Creek in the southwest of Ireland and who did not fall off the edge of the world but discovered America instead. In the late 20th century a voyage called the Brendan Voyage, using a boat similar to Brendan’s, successfully made it to America and back. In preChristian Ireland the priests were called druids; (there was a druid named Cathbad in the court of Conchobar mac Nessa king of Ulster in the first century before Christ.) The druids were involved in many of the ancient rites which were banned or pruned during and after the arrival of St. Patrick in Ireland in the 5th century AD..Their origins are open to debate, but some have connected them to the Dravidians from the Indus Valley in India. Their philosophy is said to have been derived from Pythagoras, who was a native of the island of Samos in Greece and who flourished around 500 B.C. Their subject matter was astronomy, including the size of the universe and the earth. They also were regarded as moral philosophers and, as such, they set the precepts which each king should follow. Their idea of an afterlife was similar to the Hindu doctrine of reincarnation and the Pythagorean idea of metempsychosis. Thus they believed that the spirit at the time of death passes into another body of either similar or different species. An early colonizer of Ireland Partholón arrived with three druids called Fios, Eolus, and Fochmarc meaning, intelligence, knowledge and inquiry. And all druids were said to possess these attributes. The feast of samain more popularly known today as Hallow’en was the time of year when the spirits of the dead arose and communed with their relatives. People left out food for the passing spirits just as in ancient times food was buried with the body of the recently departed. My grand-mother left sherry and cheese on her windowsill for the passing dead. Thus it is done: the poet chews a piece of the flesh of a red pig, or dog or cat, and puts it afterwards on the flag behind the door, and pronounces an incantation on it, and offers it to idol gods, and afterwards calls his idols to him…and pronounces incantations on his two palms, and calls again his idols to him that his sleep may not be disturbed, and he lays his two palms on both his cheeks, and in this manner he falls asleep; and he is watched in order that no one may interrupt or disturb him until everything about which he is engaged is revealed to him.’ Thus revelation whilst asleep was the fruit of this rite of pagan divination. Dreams have been at the centre of aboriginal cultures from Australia to India to Ireland to North America. Another notable dream rite in Ireland was the Tarbfes or the Bullfeast. ‘Is amlaid dognithe in tarbfes sin’ (it is thus that the bull feast was carried out then). ‘Firstly a white bull was killed and one took his fill of the meat and the broth, and, satisfied with that, slept, and four druids chanted an incantation for finding truth over him, and it was seen from the dreams he had the kind of man who would be king, and from the spectre in the dream a description was made; thus the work was done. The man awoke from the dream and told the vision to the king [the dream recorded] a strong noble youthful warrior with two red circles over him, standing above the pillow of a man in decline in Emain Macha.’[Emain Macha – the ancient capital of Ulster]. The bullfeast was how the early Irish chose their kings. This rite was carried out at Tara, Co. Meath which was and to an extent still is the spiritual centre of Ireland. The tarbfes shows the significance of dreams in early Irish society. The result of the dream determined who would be king, regardless of the prevailing politics; thus Lugaid Reóderg was chosen king of Tara despite the consensus of all the other provinces to exclude the Ulaid or men of Ulster. This divinatory rite continued until the coming of St. Patrick.The bull temple of the Dravidians in Bangalore/ India may commemorate an earlier version of the Bull Feast. In Bangalore there is still an annual festival associated with this bull. Druidic influence extended from the Indus Valley across Europe to the British Isles and has been recorded by Greek and Roman historians and chroniclers and by Julius Caesar. Stonehenge in England became and still is a noted druidic centre and so is Pentre Ifan between Cardiff and Fishguard close to the Pembrokeshire coast in Wales; the latter place would also, like Tara, have been a centre for initiation. In Ireland Tara and Emain Macha and Uisnech were three druidic centres and the Hill of Uisnech which marks the centre of Ireland is the place where all the provinces were said to have met. The actual centre is marked by a great stone called Ail na Uírenn, ‘the stone of the divisions’. Today it is more commonly known as the ‘Cat Stone.’ On May Day the druids lit the first fire here and all other fires were lit from this fire. Subsequent fires here were lit in Balor’s name; cattle were driven between the fires to protect against disease. This ceremony was organized under solemn incantations by the druids; at this ceremony young cattle were sacrificed to Balor. Reinforcing Uisnech as the centre of a fire cult was the enormous bed of ashes, found during excavation, which had burnt the earth red to a depth of some inches. Daragh Smyth is author of two books on Irish Mythology: A Guide to Irish Mythology and Cú Chulainn-An Iron Age Hero, both books are published by Irish Academic Press. He is a fellow of the Royal Society of Antiquaries of Ireland.